Super Covchlor Chlorine Bleach Tablets. Chlorine is widely used as a disinfectant for water, it will kill pathogenic organisms and is more effective in the long term than iodine. 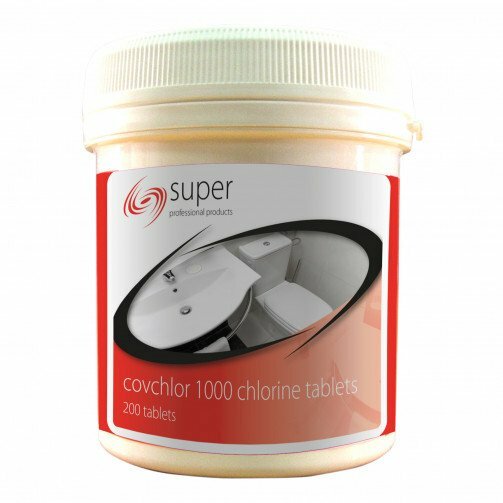 When dissolved in water, Super Covchlor Chlorine Tablets give a measured dose of available chlorine, which can be used for the disinfection of equipment, work surfaces, plant etc, in the hospital, medical, hotel and catering and local authority industries. 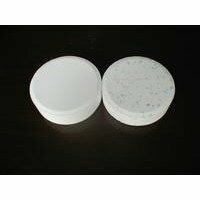 Chlorine Bleach Tablets are also used as an easily measured method for keeping swimming pools clean and clear of algae, etc. Produces a powerful sanitising solution. High activity against a wide range of bacteria, fungi, spores and viruses including A.I.D.S and Hepatitis B. Supplied in a container of 200 Chlorine Bleach Tablets.